In early September, I received a call from Ianto and his wife, Liz who used to come to the Lightwave class and also often attended the annual Gower Gasshuku. They shared with me that their new business “Pathways to Ventures (PTV)” and the Bushcraft Company were co-organizing a 3 days camp for Oxford International College (OIC) students, and invited me to join their team and to lead morning exercises, introducing Shintaido kata and kumite (forms and pair work) within the context of the planned activities at the camp. This was uncharted territory for me but it sounded quite exciting at the same time. I consulted Minagawa sensei, who kindly supported and encouraged me to jump into the deep water! I made up my mind to say “Yes” to their offer. 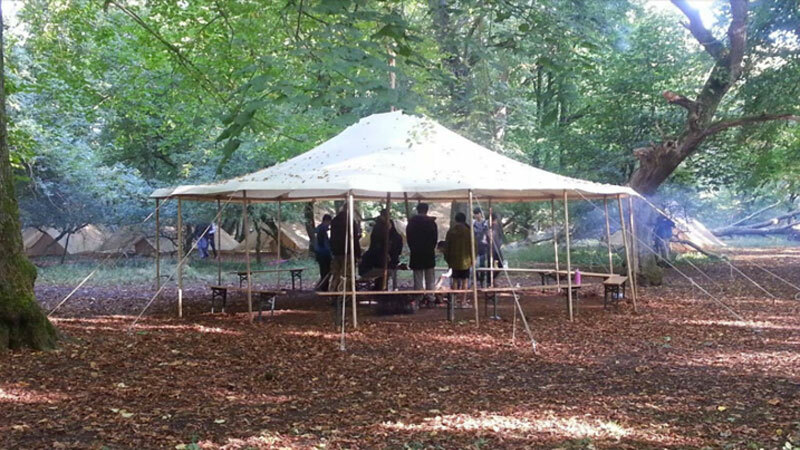 The camp took place in an ancient woodland called Wychwood Forest near Oxford, from Thursday morning on 24th Sept to Saturday afternoon, 26th Sept. It was wonderful to meet students from all over the world – Nigerian, South African, Chinese, Mongolian, Uzbekistan, Korean, Malaysian, Russian, German, Spanish, Iranian and Canadian, about 80 of them all together aged mainly from 16–18 years. On arrival at the woodland, we all walked together from the car park to the campsite, which was about three miles away, on muddy tracks and across some fields. Some of the students looked as if they were completely out of their comfort zone, not wanting to get their brand new trainers covered with mud! I was warmly welcomed by the PTV team led by Ianto and Liz, with their wonderful group of staff; Mark who works as a mentor for the OIC, Kirsti who is a psychotherapist, Sola who is an African martial artist and storyteller, Rosie who is a contemporary dancer and choreographer, and Reece who is a young volunteer full of fun and energy, and also by Mario, the principal of OIC and his staff, with 2 camp leaders from the Bushcraft company. The programme involved practical activities like fire lighting, shelter building, etc. led by the Bushcraft leaders, while games, circle times, songs, movements, drumming and storytelling were mainly led by PTV. Early on Friday, I led morning exercises for the 1st year group of about 50 students, while Sola was leading 2nd year group at the other end of the clearing in the wood. At first, I could see that most of the students would have rather wanted to stay curled up in their sleeping bags. It was even hard just to form a big circle! As soon as we started to move gently with rhythms, they became more awake, and by the time we did Chudan honzuki (mid level thrusting) with kiai (voice), they were really into the movements, enjoying shouting “Ei, Yah, Toh!” After this, I was amazed to hear them repeating my gorei, counting in Japanese, as if echoing back to me. At the end, we finished with massaging each other in a big circle, getting ready for another full day. 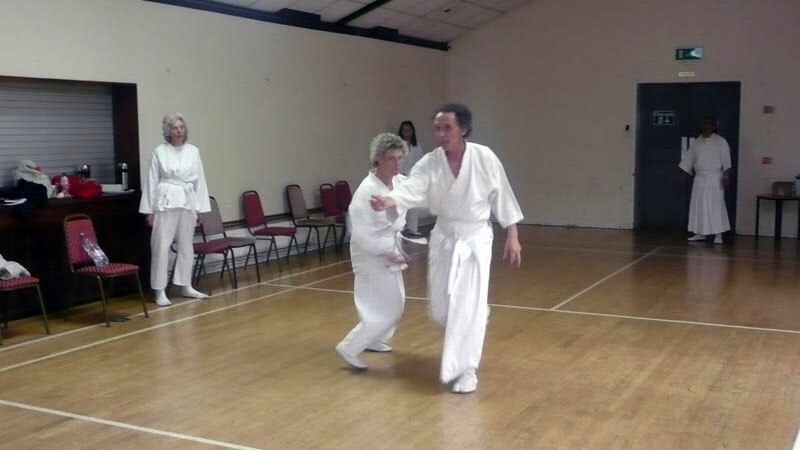 I also introduced Renki kumite (Kneading energy pair work) in the gender circle for girls, which Liz was leading, as an introductory exercise to explore Ma (space) and connection with each other, and also did Tenshin goso. Although Liz and I discussed and made a plan, we had to work spontaneously and flexibly, depending on the students’ conditions and their mood. It felt natural and easy to do so thanks to Liz’s supportive and open energy. I was quite moved by watching the process of the students’ transformation by being out in nature, singing, dancing, moving, eating, sleeping and sharing together. As for myself, I was actually not feeling very well the night before the camp, wondering if I could make it or not, but to my surprise, I was completely healed and got energized by being there, even though it was intensive work. By the way, on the note of Shintaido outreach, Hawkwood college, where we did some demonstrations and workshops at their Open Day and their Seed Festival this summer, have invited us to give a weekend residential Shintaido workshop from 22nd July to 24th July 2016. It is my wish that the seeds of Shintaido spread like dandelion seeds blowing in the wind, landing wherever they find themselves, growing their roots deep down into the earth and blossoming their nature brightly and happily under the sun.